I have owned this mouse for exactly a year now, and thought I’d give it the review it deserves. There are plenty of reviews out there for unboxing and all that stuff, so this review will focus primarily on its functionality. I’ve gotten this mouse to replace my trusty ol Logitech MX518 that served well for 7 years. That mouse felt great to use despite it only being optical, and not surprisingly, its price is still the same after all these years! The replacement mouse has a lot to live up to! I browsed many Razer mice, but never took a liking to any of their designs. 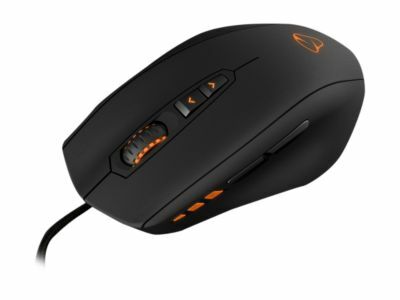 Luckily, I stumbled upon a fresh release of the Mionix brand, and immediately liked their top end model. Sure, the hefty $80 price tag then (its $90 today) looks overpriced for something made in China, but a year later I can say with confidence that this is a quality product. Really neat features are a braided cord that is much tougher than typical usb wires, a weight system that I can actually feel an impact with (although I’ve only compared empty vs. full weights), the most amazing contour feeling ever as it doesn’t leave the ring and pinky fingers dragging alongside the mouse. The braided cable is just sturdier, nothing else about it stands out but it’s more than other mice. The weight of the mouse while empty feels like a cheap plastic $10 mouse, until all weights are added. Now the heavier feel of the mouse gliding across surfaces feels more defined, as the mouse doesn’t feel like it wants to move past where I want it at. The ergonomics design of the mouse is superb! Coupled with a cheap mouse pad with wrist support, I don’t feel any fatigue after a long day of computing. The mouse itself looks great too, it has a rubberized feel to it that hasn’t worn at all, and it’s not lit up like crazy. Moving on to mechanical insights, the scroll wheel has notches. I absolutely dislike using low friction scroll wheels, as they scroll TOO MUCH! An important feature is on the fly DPI adjustment, just like the MX518. There are 3 modes for sensitivity that are plug and play. It can be further defined using Mionix’s software. Back and forward buttons are there with the same annoying ease of the back button being accidently pressed when grabbing the mouse. It has 4 large Teflon feet which are doing amazingly well after a year’s use. One difference I noticed between my old optical mouse and this new laser mouse is that while on the optical mouse, I set the DPI to its highest of 1800dpi; the 5040dpi max on the laser mouse is a little overwhelming to me. But nonetheless, it’s nice to know I can get that high. The LED’s installed in this mouse are unique; they can reflect any shade of color you choose. The default plug & play color is green, and can only be changed through Mionix’s software. I’ve got it glowing the same blue color as my Razer Lycosa, it looks great! The option is there to also disable any light. The software that’s designed for the mouse has a lot to offer. Every button is reprogrammable to something else, even to a macro. The lights have the ability to change colors and can even be selectively switched off. Out of the 4 regions where the led lights up, user can choose which they want lit. There’s a great setting called Lift Distance. It disables the mouse if it’s lifted above a certain point. Great for those of us who have small mouse pads and have to re-center the mouse. DPI can be redefined; even can set a different DPI for X axis and Y axis. The program leaves a small impact on system performance, using only 5,256k of memory. It has never risen beyond that nor caused me any issues. Here’s the bad stuff. The braided cord has started fraying where it goes off my desk. Since the mouse is moved all the time, this is normal, and the cord retains full functionality. It just sorta looks like a centipede now on that segment. When I used this mouse as plug & play, sometimes after a restart the mouse would not be detected until I reconnected the mouse. This was a bit annoying and was resolved by install Mionix’s software. Also resolved from installing the software was a weird color glitch. Half the mouse was green while the other half was blue. This occurred out of the blue (lol) and self-corrected, but it’s never reappeared after its software was installed. Do your own research before making (semi-)expensive investments! But as far as my review goes, this is the perfect mouse in my opinion. Any questions pertaining to the mouse are welcomed, just leave it as a comment below. This entry was posted	on Saturday, August 11th, 2012 at 12:00 PM	and is filed under Reviews, Texts. You can follow any responses to this entry through the RSS 2.0 feed. You can leave a response, or trackback from your own site.